Frida Fornander, 21, from Gothenburg was crowned Miss Universe Sweden 2017 last June. She has been working as a model since she was 15 and has participated in over 15 national and international contests. Know more about her preparations for the upcoming Miss Universe pageant in this Beauty Talks. I practiced and competed in ice skating when I was younger, and I believe that it was a great preparation for future pageants since I learned all about hard work, team work, body control and to always wear a smile! How would you describe Sweden to your fellow contestants? Sweden is a beautiful country with incredible nature and seasons, a rich history and a very supporting system that provides free school and health care. Something many may not know about Sweden is that we are very multi cultural. A healthy, balanced lifestyle. And to use natural products like coconutoil as a moisturizer for my face, body and hair. It really does magic! What were your current preparations for your international competition? Time flies and of course it is a lot to prepare for the big event. I’m working out at lot since it also helps me to focus and provides me with the energy I need. I’m working on my walk and QA with my wonderful pageant coach from the Philippines Allan Perlado. Besides that, I’m currently travelling around in Sweden to do motivational speaking, since I love to inspire people to reach a healthy lifestyle and to never give up on their dreams. That will also help me for the interview potion hopefully! I’m very thankful for my experience in beauty pageants, so I know what to prepare and what to expect when I arrive at Miss Universe in November! Since when were you interested in pageants? I did my first pageant in 2011 when I was only 15 years old. I got to represent Sweden in Miss Teenager Universe which was the start of my pageant career. Ever since then I have taken part in fifteen national and international pageants – but the goal has always been Miss Universe. 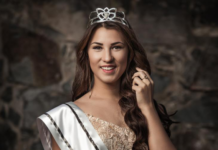 What makes you proud of being Miss Universe Sweden 2017? Being an ambassador of a whole nation is mind blowing. To earn the title as Miss Universe Sweden has been my biggest dream as long as I can remember, and thanks to my determination I finally won the crown on my third attempt. To be able to show others that you should never give up on your dreams is very important to me, since I love to inspire people. What would you say to other Swedish girls that would like to participate in a beauty competition? Thanks to beauty pageants I’ve got to travel the world, I’ve met the most interesting and meaningful people in my life, I’ve earned confidence, I’ve learned about other cultures and most important – I’ve been able to take part in many charity causes. If you have the interest for pageants, don’t hesitate. It has changed my life, so why not give it a try and it might as well change yours. What qualities do you think will enable you to win the crown of Miss Universe? Hopefully my humbleness mixed with my confidence and experience will help me show the judges that I have the qualities it takes to win Miss Universe. I always say that the girl who wants it the most will win the crown. I really want to win, and hopefully it will show trough my drive and determination. When I want something – I will work hard until I get there. And finally a message to all your fans. There is nothing you can’t do, once you have decided to do it. Thank you for all the love and support I receive daily!